Colouring outside the box and win! 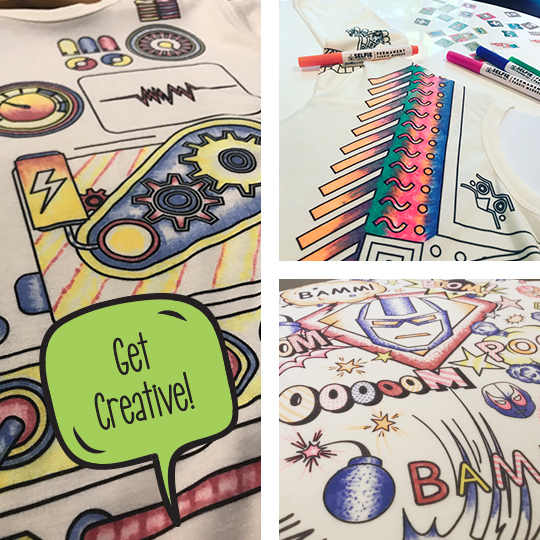 Here at Selfie Clothing we are so into kids free-styling with their colouring in, whatever goes! It’s all about two big words for us: Imagination and Pride. There’s nothing we love more than letting kids’ imaginations run wild with colour and witnessing the sense of pride they achieve from creating their own tops, capes and pyjamas. For kids (or adults!) who want a few more ideas than the standard block colouring in why not try some new techniques? Again, it’s all about thinking outside the box and experimenting with new skills. We love to ombre, shade, dot and stripe. Leaving a little white on the garment can help add depth and movement also. Keep tagging us in your pictures, as each month one lucky person who has tagged us will win a Selfie Top of their choice. Follow us on Instagram #Selfieclothing and Facebook.